Continue adding rolls moving across the area until all of the mdf is covered and you have created the height and shape you want, make sure you keep the curving edges of the mermaid by squeezing the foil into the shape. When these are complete take flat pieces of foil and wrap one across the whole foiled tail area and one across the head to keep everything in place. 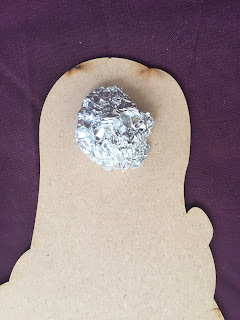 Tuck the excess foil to the back of the mermaid ensuring that you mermaid still sits flat.